Sierra Concrete Resurfacing offers the best in decorative concrete resurfacing in the Roseville, California area. Both residential and commercial service are available. Their wide array of concrete designs, textures, products and applications has made them the leading decorative concrete company in the area. Sundek Classic Texture – this concrete resurfacing application has been around since the 1970’s and is one of the most common applications installed on commercial and residential pool decks and other areas. The appealing looks, unlimited designs, durability has made it the Gold standard of the industry in the decorative concrete industry. One of the other reasons this acrylic cement textured finished coating is so popular is that it is cooler than regular concrete so you won’t burn your feet in the hot sun, making our pool deck resurfacing installations a popular choice. Stamped Concrete Overlays – Traditional stamped concrete can be very expensive due to the fact that it has to be installed on top of brand new concrete, this means that if you have an existing patio, driveway or pool deck that you would like to make look like natural stone, wood, limestone or other natural surface, you must tear out and re-pour the slab of cement. Stamped overlays allow you to get the same look without tearing out and re-pouring a new slab of concrete. You can install the decorative coating right on top of an existing piece of concrete saving you time and money! Concrete Staining – If your looking for a rich looking, low maintenance solution for an indoor concrete floor then you may want to look at our stained concrete applications. We offer water based stains as well as acid staining for your cement flooring needs. There are many unique colors and designs to choose from. Epoxy Floors & Polyurea Polyaspartic Coatings – If you have ever seen a decorative chipped garage flooring application there is a good chance that it was either an epoxy flooring system or a polyurea polyaspartic product installation. Both of these concrete flooring options are excellent choices for garage floors and commercial locker rooms. Their ability to hide dirt as well as resist oil stains and other grime brought in by one’s automobile make them a great choice. Concrete Resurfacing – Whether you have brand new concrete or old chipped, cracked and ugly cement on your patio, pool deck, driveway, front entryway or interior floor, we can repair and resurface your concrete giving it a brand new look of your choice! You can choose from many deigns, products, textures and colors to make your project look amazing. 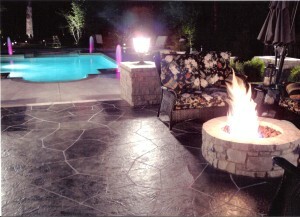 Concrete Designs – Our ability to help you choose the right design that will compliment your home along with installing a premium Sundek concrete product with our level of experience and in house employees is what has made us the leading decorative concrete resurfacing contractor in Roseville, CA today.